It's Lammas, or Lughnasadh, the Sabbat where many Pagans choose to celebrate the beginnings of the harvest. This Sabbat is about the cycle of birth, life, death and rebirth -- the grain god dies, but will be reborn again in the spring. Depending on your tradition, you may also observe this Sabbat as the day of the Celtic craftsman god, Lugh. Either way, you can try some or even all of these ideas -- obviously, someone using a bookshelf as an altar will have less flexibility than someone using a table, but use what calls to you most. It's the end of summer, and soon the leaves will begin to change. However, the sun is still fiery and hot. Use a combination of summer and fall colors -- the yellows and oranges and reds of the sun can also represent the turning leaves to come. Add some browns and greens to celebrate the fertility of the earth and the crops being harvested. Cover your altar with cloths that symbolize the changing of the season from summer to harvest time, and use candles in deep, rich colors -- reds, burgundies, or other autumn shades are perfect this time of year. 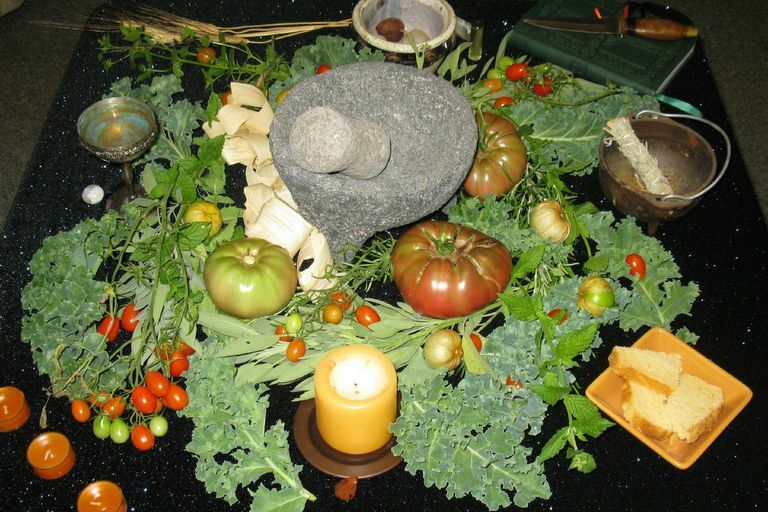 The harvest is here, and that means it's time to include symbols of the fields on your altar. Sickles and scythes are appropriate, as are baskets. Sheafs of grain, fresh picked fruits and vegetables, a jar of honey, or loaves of bread are perfect for the Lammastide altar. If your celebrations focus more on the god Lugh, observe the Sabbat from an artisan's point of view. Place symbols of your craft or skill on the altar -- a notebook, your special paints for artists, a pen for writers, other tools of your creativity.